My adorable husband has quickly adapted to my new situation as a dependent woman. Making the bed, doing the house cleaning, buckling me up in the car, picking up heavy stuff, being the Strong Guy who can unscrew stubborn jar lids for me, no problem, he can handle all this … But playing taxi driver in order to go push a cart through the aisles of a food store, even organic, forget it! He is completely in favor of women’s emancipation and just can’t figure out what motivates Saudis to forbid their wives to drive… Anyway, so we tried limiting our food trips to just once a week. I had my doubts. And so did the bananas. After several days they started looking mighty pitiful in the fruit basket…. Whoever invented banana nut bread was a genius! The winning flour combination in my marble cake made me rethink my old recipe in its entirety. I never translated it into English and won’t bother now. With only two different sorts of flour and no starch, less sugar (I omitted the crumble topping) this new gluten-free banana bread recipe is simpler. Dear neighbors, I invite you to come and share it with us: will it be tea or coffee for you? 1. Beat together yolks and sugar, until mixture turns pale yellow and happy bubbles form. 2. Successively add in tsp vanilla extract, walnut meal and chunks, oil, flours, then baking soda activated with lemon juice. 3. Beat egg whites until stiff peaks form (I usually add a pinch of salt to the whites) and fold into batter. 4. Pour into cake pan and bake for 55 minutes. Check for doneness with a toothpick or a thin knife blade. Dear neighbors, I sincerely hope you can try this recipe. 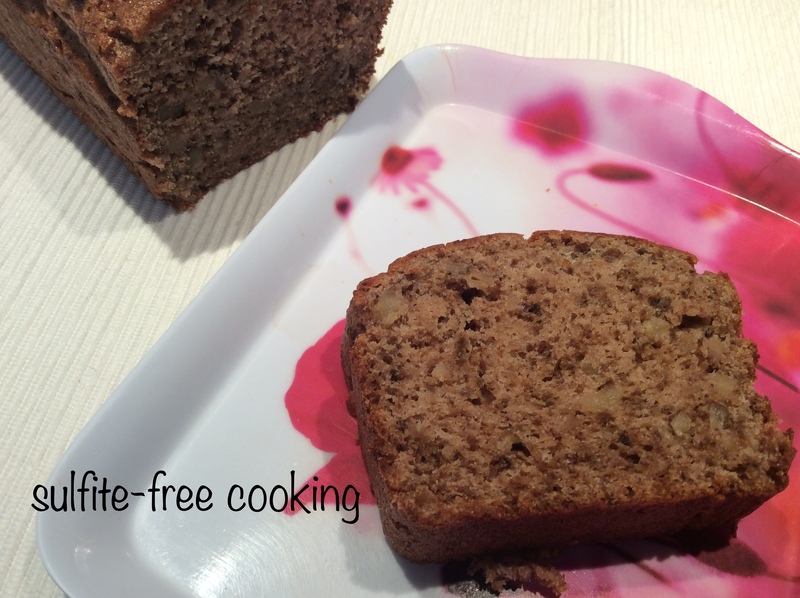 If you like banana bread and you can find chestnut flour, this gluten-free version will not disappoint you! Next versatile, easy-to-make patties in three versions… and my true nature revealed! This looks amazing!! Banana bread is one of my favorite things, and I even use mashed ripe bananas to flavor homemade granola (It’s amazing….). I think the separated eggs must be the key to this recipe, non? Looks like it makes a great texture and lightness. You are absolutely right! In the classic recipe you don’t bother with separating yolks and whites. But this being gluten-free you need some “trick” to make it light. I am so pleased I finally came up with something as delicious as this. I’ve already made it twice and frozen slices for unexpected guests. Wanna come over with your girls ? Your granola banana mix sounds interesting. Well done! I don’t eat gluten-free, but I have several friends that do, so I will share this recipe with them. And I will definitely try it myself! I can’t stop making it – I don’t know if you eat oats or not, but it’s easy and tasty. Just pureed ripe banana with some oil and honey mixed into oats, walnuts, and shaved coconut (and baked). Divine! Oh, thank you! I do eat oats, I am so grateful I can find gluten-free ones. My picky guts know when they are not ☹️. I even use them to make a GF recipe for a salty pie crust that gets blitzed in the food processor, with only one hand needed! You’re welcome 😊. I had given some to my parents and my mom just called me to say they loved it (she never lies to me about my gluten-free food!). Another plus: this cake freezes very well.